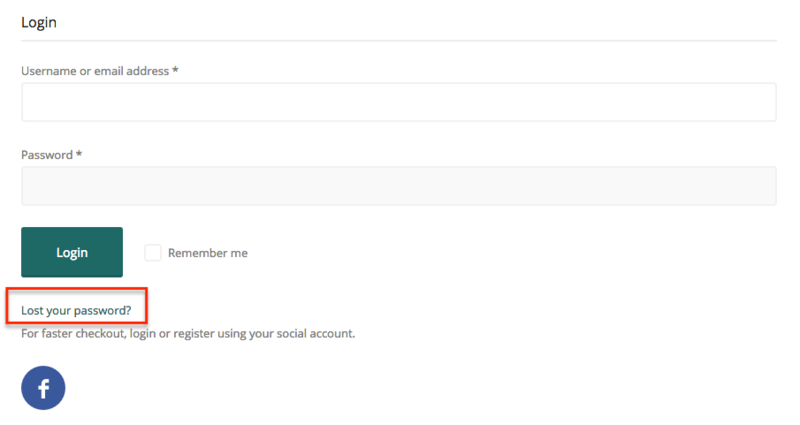 The Username by default is your ‘First Name’. If you have not entered your first and last name , your email address is used. To update go to your ‘Edit Profile’ on your Dashboard and enter your first and last name. I joined as a user but now want to be a supplier & list my business, what do I do? 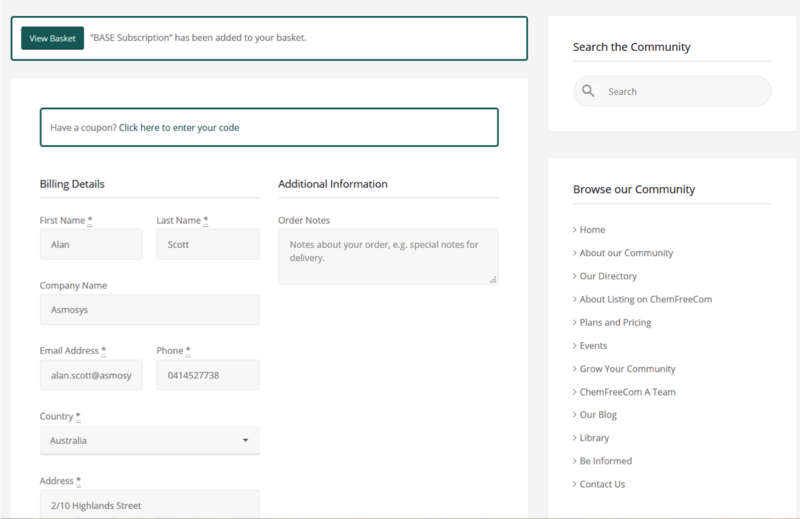 If you have signed up on ChemFreeCom and would like to list your business on ChemFreeCom simply select ‘Submit Listing’ from the 2nd menu on the home page to create your listing. You will then be asked select a subscription level and enter your billing details. See ‘Business’ tab in FAQ for assistance in listing your business. What is a Category (Service - Product - Business Opportunity)? Categories give you an extra level of search capability. All suppliers are asked to nominate the categories that are applicable to their service/products. We offer the ability to search via Product, Services and Business Opportunities categories. Our list of categories covers not only food, cafe’s, restaurants and household/building products but services as well, hairdressers, beauticians, cleaning , gardening , pool cleaning, pest control, carpet cleaning, dry cleaning, building analysis and even what biological dentist is out there that can remove my amalgams? . Our goal is to grow the overall Chemical Free Community. Whether you are currently in business and looking to expand or your looking to transition to a chemical free work environment you can search via the business opportunity categories to identify what business or employment opportunities are available. the User to search one or many of the specific “chemical statuses” . You can select your chemical status filters on your search page. 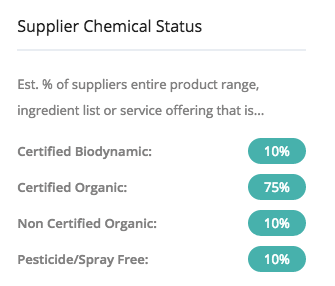 if a Supplier is listing a restaurant or cafe and they source on average 60% of their total ingredient list from certified organic, or organic, or even pesticide/spray free they can nominate the % relevant to your business. Becoming Cert Biodynamic: tick this if you hold a Conversion certification for applying Bio-Dynamic practices on your farm. If it relates to your entire farm select 100% or other nominate a % as appropriate. You must upload your certification and update your certification once you are fully certified. Becoming Cert Organic: tick this if you hold a transitional certificate called “In Conversion to Organic” or “Organic in Conversion” for your farm. If it relates to your entire farm select 100% or other nominate a % as appropriate. You must upload your certification and update your certification once you are fully certified. Cert Org Ingredients at Point of Origin: tick this if you have a product/products that are not certified however a percentage of the total ingredients are certified organic. Select the appropriate % e.g. If 6 out of 10 ingredients are certified organic = 60%. Always be prepared to validate your %. Certified Non-GMO: tick this if your product/s have been accessed by a credible certifying body and you hold Non-GMO certification. Please nominate the percentage of your product line that holds this certification. You must upload your certification. Certified Biodynamic: tick this if your product/s have been accessed by a credible certifying body and you hold Biodynamic certification. Please nominate the percentage of your product line that holds this certification. You must upload your certification. If you are a retailer (not certified) that carries Certified Biodynamic stock please indicate the approximate % of your product line that is Certified Biodynamic – you are not required to upload certificates of all your suppliers however please be prepared to validate your %. Certified Organic: tick this if your product/s have been accessed by a credible certifying body and you hold Organic certification. Please nominate the percentage of your product line that holds this certification. You must upload your certification. If you are a retailer (not certified) that carries Certified Organic stock please indicate the approximate % of your product line that is Certified Organic – you are not required to upload certificates of all your suppliers however please be prepared to validate your %. Certified Organic Farm: tick this if your farm have been accessed by a credible certifying body and you hold Organic certification. Certified Organic Manufacturer: tick this if your manufacturing plant/processes have been accessed by a credible certifying body and you hold Organic Manufacturer certification. If it relates to your entire operation select 100% or nominate another % as appropriate. You must upload your certification. Certified Organic Processing: tick this if your manufacturing operations, processing and handling have been accessed by a credible certifying body and you hold relevant Organic certification. If it relates to your entire operation select 100% or nominate another % as appropriate. You must upload your certification. Certified Organic Retailer: tick this if your retail business/processing have been accessed by a credible certifying body and you hold Organic Retail certification. If it relates to your entire operation select 100% or nominate another % as appropriate. You must upload your retailer certification, you are not required to upload organic certification of your suppliers. Certified Organic Textiles: tick this if your textile processing, trade chain have been accessed by a credible certifying body and you hold Organic Textile certification. If it relates to your entire operation or product line select 100% or select the appropriate % e.g. if 6 out of 10 textiles used in your products are certified organic = 60%. Always be prepared to validate your %. You must upload your certification. If you are a retailer (not certified) that carries Certified Organic Textiles please indicate the approximate % of your product line that is Certified Organic – you are not required to upload certificates of all your suppliers however please prepared to validate your %. Certified Organic Wholesaler: tick this if your importing, exporting, wholesaling, distribution, processing, transport and storage have been accessed by a credible certifying body and you hold Organic Wholesaler certification. If it relates to your entire operation or product line select 100% or nominate another % as appropriate. You must upload your certification. Non Certified Biodynamic: tick this if your farm or your product/products have ingredients grown using the practices of Biodynamic farming. If it relates to your entire farm select 100% or nominate the percentage of your product line that has followed Biodynamic practices. Always be prepared to validate your %. Non Certified GMO Free: tick this if you have a product/products that are not certified GMO Free. Select the appropriate % e.g. if 6 out of 10 ingredients are certified GMO Free = 60%. Always be prepared to validate your %. Non Certified Organic: tick this if your farm or your product/products have ingredients grown using the practices of Organic farming. If it relates to your entire farm select 100% or nominate the percentage of your product line that has followed Organic practices. Always be prepared to validate your %. Pesticide/Spray Free: tick this if your farm is managed or your product/products have ingredients grown without the use of chemical fertilizers, pesticides or herbicides. If it relates to your entire farm select 100% or nominate the percentage of your product line that has followed pesticide free practices. Always be prepared to validate your %. If you are a retailer (not certified) that carries pesticide/spray free stock please indicate the approximate % of your product line that is pesticide/spray free – please prepared to validate your %. Toxic Chemical Free: tick and ‘ballpark’ the toxicity level or your product, product line or service offering. We support any product/service that is LESS toxic than then conventional. We ask you to be honest and transparent. Access your ingredients using either the ‘Chemical Maze (book or app)’, ‘Skin Deep’ or a comparable chemical/product toxicity tool. Evaluate the number of happy, quizzical, unhappy faces using the Chemical Maze or Low-Moderate-High hazards using ’Skin Deep-EWG tool’ and select the appropriate % e.g.. if 2 out of 10 ingredients score a quizzical & unhappy face select 80% Toxic Chemical Free. This is an estimate only, you can update your % as you improve formulations. Always be prepared to validate your %. Not sure… we are always happy to assist establish your % – we refer to our technical adviser Bill Statham author of the Chemical Maze for guidance. Wild Harvest: tick this if you have a product that has a percentage of the total ingredients grown/sourced wild in nature without human intervention and ideally been harvested following wildcrafting guidelines. Select the appropriate % i.e.. if 3 out of 10 ingredients are wild harvested select 30%. Always be prepared to validate your %. NONTOXIC CERTIFIED: tick this if your product/s have been accessed by NONTOXIC CERTIFIED and you hold NONTOXIC CERTIFIED certification. The NONTOXIC CERTIFIED™ seal means that a product has passed MADE SAFE and gone on to be lab-tested to ensure that it – in totality – is not toxic. Please nominate the percentage of your product line that holds this certification. You must upload your certification. What is a 'Free From' Filter? Free From Filters give you an extra level of search capability as all suppliers are asked to nominate the filters that are applicable to their service/products. The more free from filters (that are applicable) they use on their profile the better search ability for you, the user. We have filters relevant to a number of different chemicals and groups of chemicals. Search by free from filters from the search page. If we have missed any that you think we need to add let us know. On a business listing you will see the filters listed in the side bar of the listing. Zoodle Enterprises is the proprietary limited company in which ChemFreeCom.com operates. All invoices generated will reference Zoodle Enterprises Pty Ltd. Supplier subscriptions paid by PayPal automatic deductions are paid 1 month in advance. 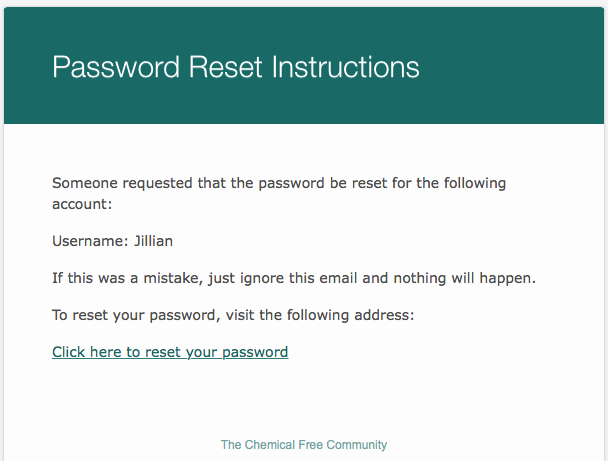 You can choose to terminate your registration at anytime by providing info@chemfreecom.com written intention to do so. If this request is received at least 14 days before the expiry of the prepaid month, no further payments will be required. Refunds for a prepaid month are not available. 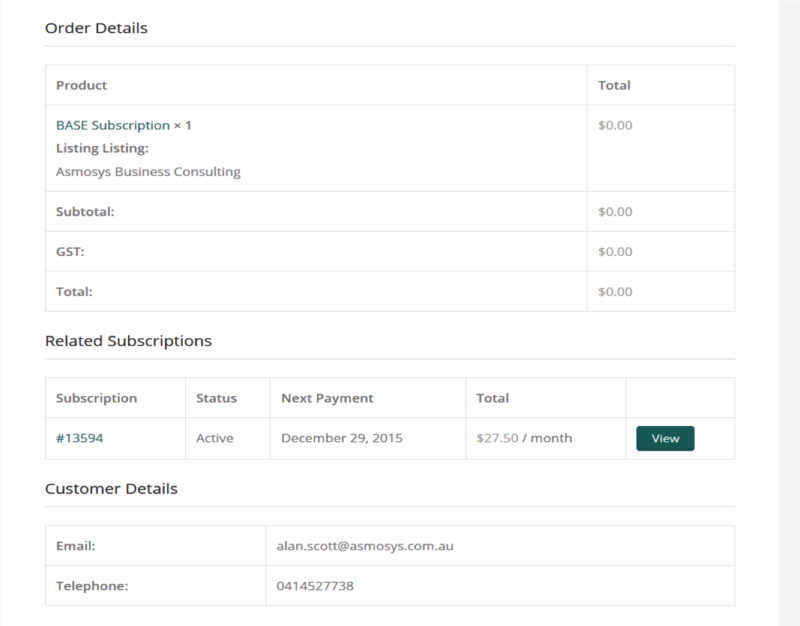 For supplier whose subscriptions are paid by annual invoice, a refund will be calculated from the following month of the request for the remaining months of the annual subscription. Does CFC provide any guarantees, assurances or insurances? Short answer is – no we don’t. This is covered in our Terms of Usage that can be found on the T&Cs tab. As a Supplier – please check out the Plans and Pricing page for the packages that we offer. Does CFC have Standard Operating Procedures? We do have base SOPs and these will be enhanced as we grow and move into additional versions of the directory. What would you like it to be? As a community we are growing and if there is a particular role that you would like to play – let us know via the contact page. 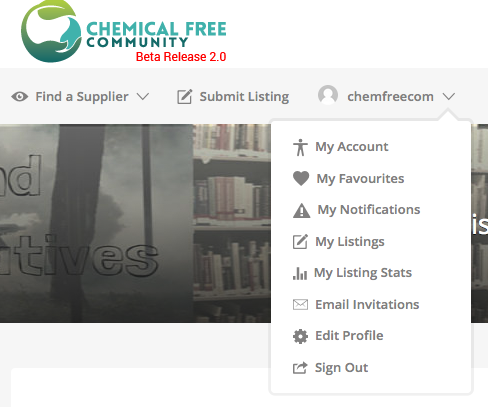 As a Supplier, keep you profile up to date, interact openly and honestly with ChemFreeCom Users and, hopefully, promote the community to your friends and associates. As a User, share your thoughts, comments and chemical free ideas, be open and honest in your interactions with the suppliers and SCOUT for the community by inviting suppliers to join. As a collective we expect you comply to the Terms of Usage and Privacy Policies as outlined on the site. Is ChemFreeCom mobile and tablet friendly? ChemFreeCom.com community pages, directory and events calendar are responsive for tablets and phones. Our Facebook page – Chemical Free Community and our Twitter page – @chemfreecom would both be available through the Facebook and Twitter Apps. Why do I need to register on ChemFreeCom if I can search for free anytime? Yes, that is correct that you can search ChemFreeCom any time, all day, every day and you do not have to be registered with us. However there are a number of benefits of registering as a user. You are able to save your favourite suppliers, so you do not have to search for them every time. You can review suppliers and add comments that will assist others in making decisions as well as supporting our wonderful suppliers of chemical free services and products to build their business. 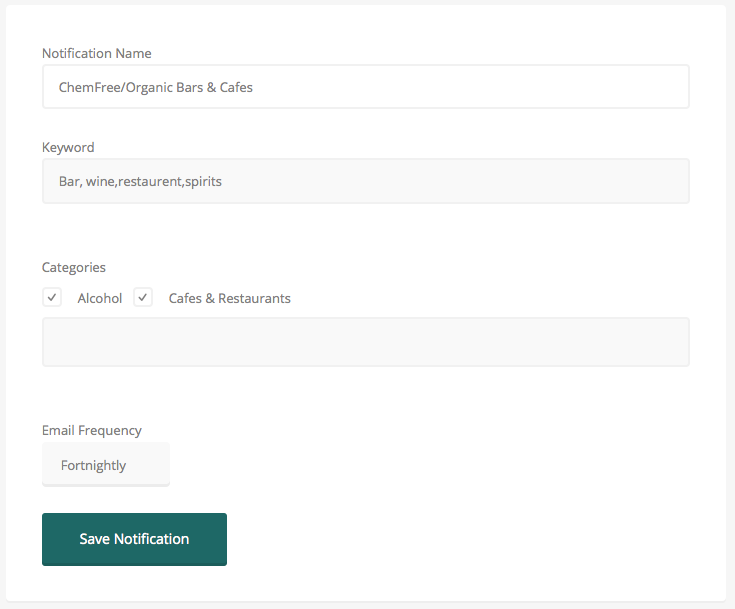 You will be able to nominate your preferences (hairdressers, accommodation, BPA free, Chlorine free etc) and receive notifications as new suppliers join ChemFreeCom, who’s profile preferences match your preferences. You can invite friends and worthy suppliers to the community from your Dashboard. ..by joining the Chemical Free Community, you add the to growing number of like minded people that want to live a life that is less toxic – who want to have a choice! The more users we gather, the more of a statement the collective ‘WE’ make that we are a ‘GROWING’ market and we are actively looking for services and products that support our ability to have a choice! 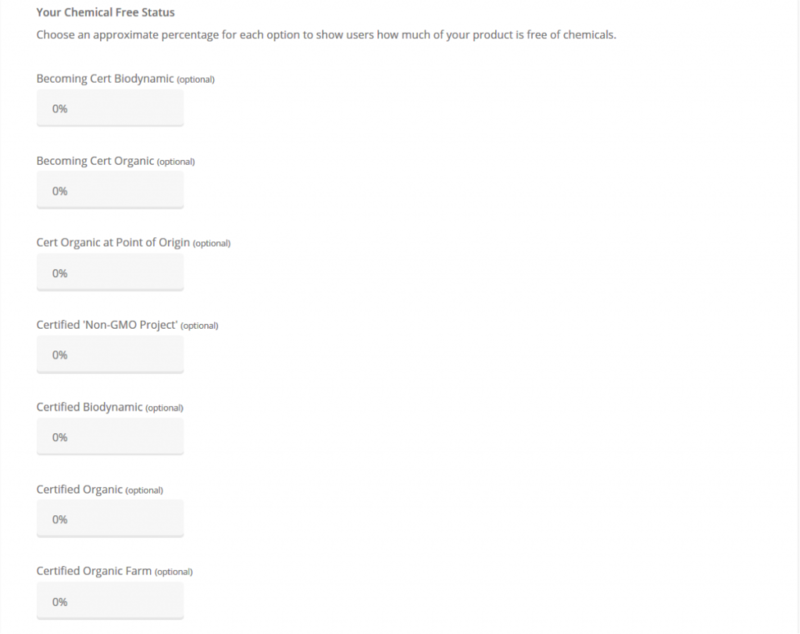 How do I search for Chemical free businesses on the directory? Searching is easy! 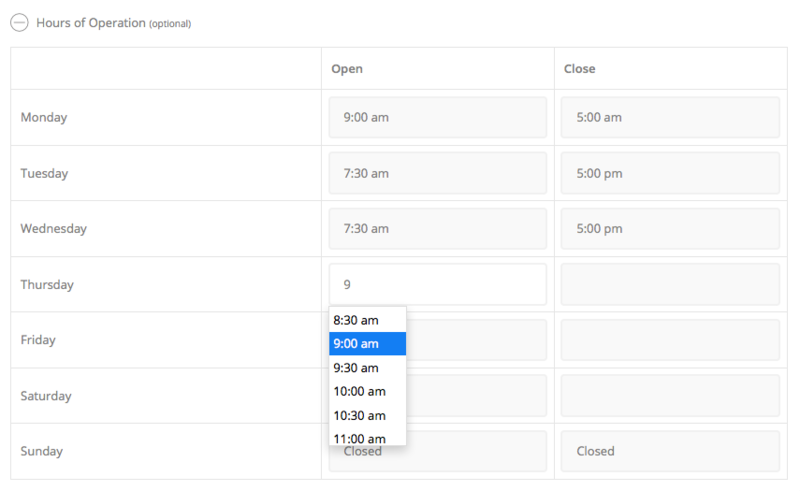 Search Keywords, Location or Category from the home page, or use the “Browse” options in the second menu line. You can continue your searching from your ‘Search Results’ page using Chemical Status and Free From filters. The keyword search draws from the Suppliers’ business name and description of the service or product on a suppliers their profile. Enter a keyword for your search. Use nouns as query keywords and use 6 to 8 keywords per query. Include both singular and plural version of for your keywords such as “juice” and “juices”. Begin to enter the location that you wish to search, you will be presented with a list of options in a drop down list compliments of Google. You can search an area as small as your town or your county. Select your location. Once your search results have been displayed you will have an option to define the radius of your search based on your IP address by using the slider. You are also about to turn off the radius search by un-ticking the radius box. NOTE: this function is not fool proof as is uses an IP address which can change and sometimes your IP addresss is from the nearest town or city. Our goal is to grow the overall Chemical Free Community. Whether you are currently in business and looking to expand or your looking to transition to a chemical free work environment you can search via the business opportunity filters to identify what business or employment opportunities are available. All suppliers are asked to nominate the filters that are applicable to their service/products. The more filters they use on their profile the better search ability for you, the user. We have filters relevant to a number of different chemicals and groups of chemicals. Filters can be located in the right side bar of the Supplier’s listing. 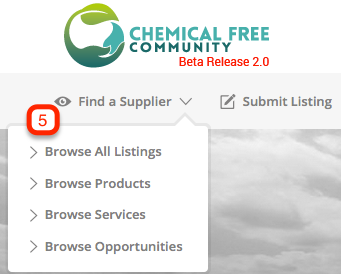 Use the “Browse” options in the second menu line on the home page , located just beneath the Chemical Free Community logo. Browse ‘All Listing’, ‘Products’, ‘Services’ or our ‘Business Opportunities. 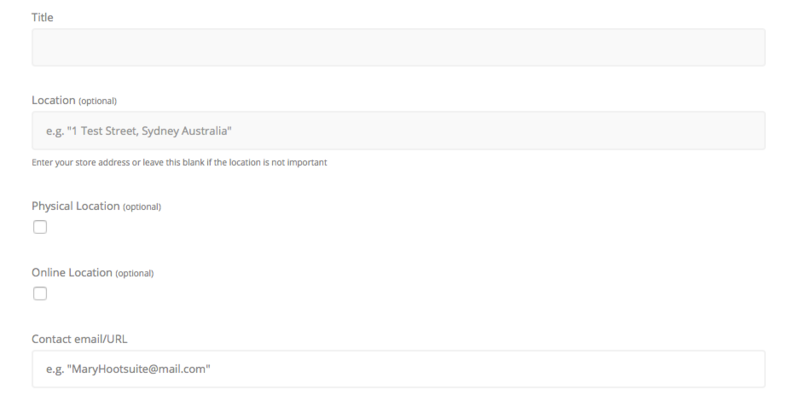 You can continue your searching from your ‘Search Results’ page using Chemical Status and Free From filters. 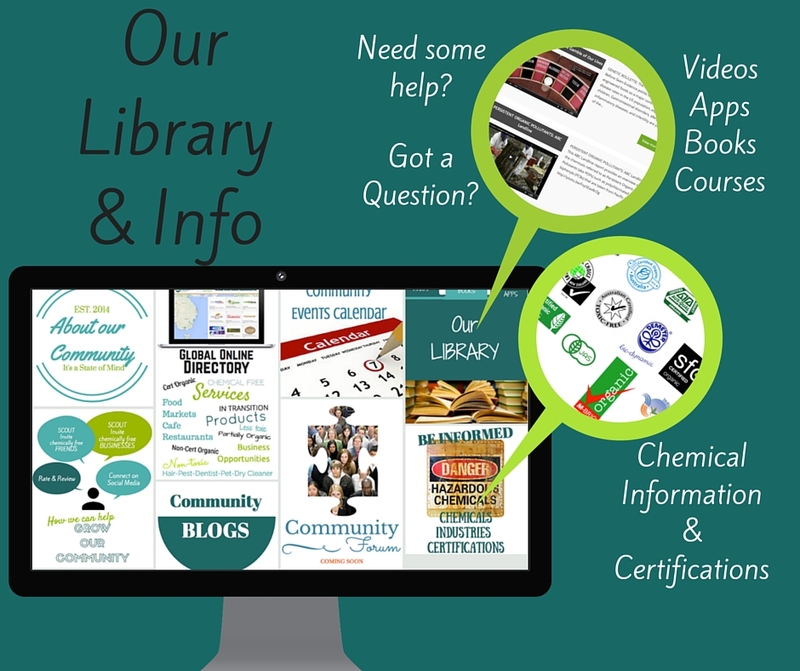 What is the Chemical Free Community Library and Be Informed pages? The more informed we become the more conscious we are about purchases for ourselves and our family. Whether you are a ‘converted’ ChemFreeCom’er, a ‘wanna be’ ChemFreeCom’er or a ‘in transition’ ChemFreeCom’er we have information and resources that can support your hunger for knowledge and solve the continual quest for that ‘first or next step’ in your transition. 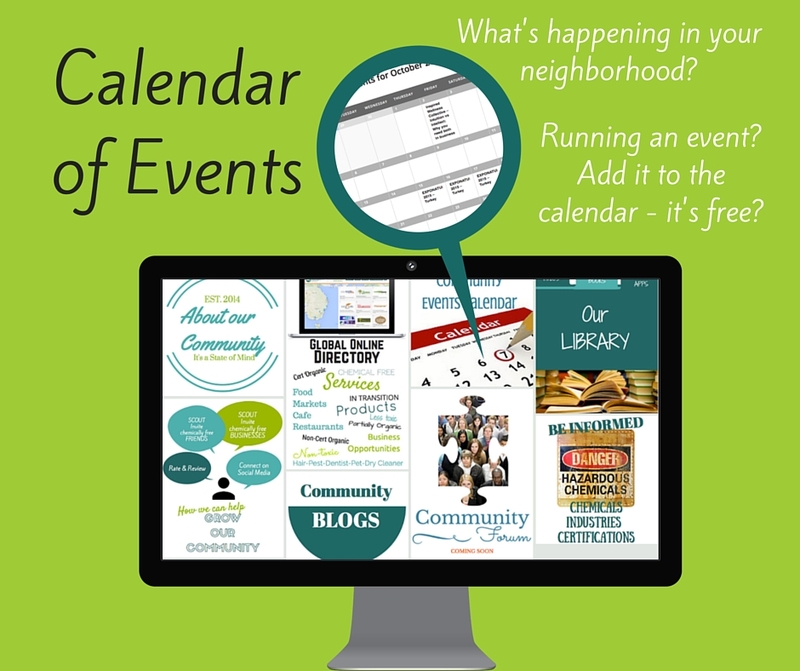 What is the Chemical Free Community Events Calendar? Looking for Chemical Free Events? Want to know what is happening in your area? Search for Chemical free workshops, e-courses, launches, festivals, film night what ever..
How do I 'Sign Up' with Facebook? You can sign up with email and/or Facebook. If you join with Facebook, go to your Dashboard and update your profile. 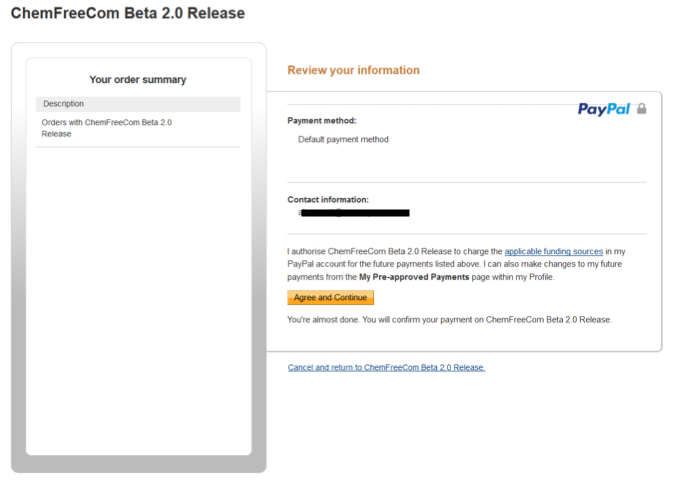 The only information you will share with ChemFreeCom in your public profile (name and email address). You will not have to share any of your FB friends or pages. What is 'My Notifications' on my Dashboard? Want to know about new businesses when they list on chemfreecom? Create your own notification emails for your area of interest using ‘My Notifications’ on your Dashboard. 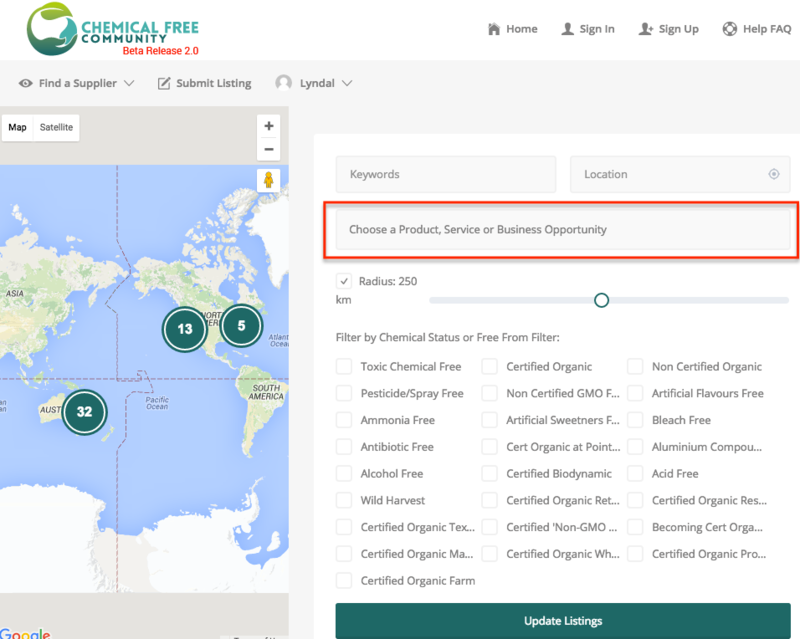 Businesses listing on ChemFreeCom are asked to profile their service/product according to type of products, services and /or business opportunities. As a user you are able to create a notification the is emailed to you either daily, weekly or fortnightly with new listings based on your selected criteria. Either select ‘Add Notification’ from your Dashboard or select “Notify me of Listings like this’ button located at the bottom of each listing. Enter the name/subject title for your email notification in ‘Notification name’. This is specific for you so enter an email subject title that makes sense to you. Select your email frequency daily, weekly or fortnightly. You will then be informed when a new service/product and business opportunity has been listed on ChemFreeCom, that is aligned with your preferences. Can I save my faviourite businesses? Yes. You can save your ChemFreeCom favourite suppliers by adding them to your ‘My Favourites’. Click on the Favourites Heart located in the header banner of the supplier. Can I review a supplier? Yes. 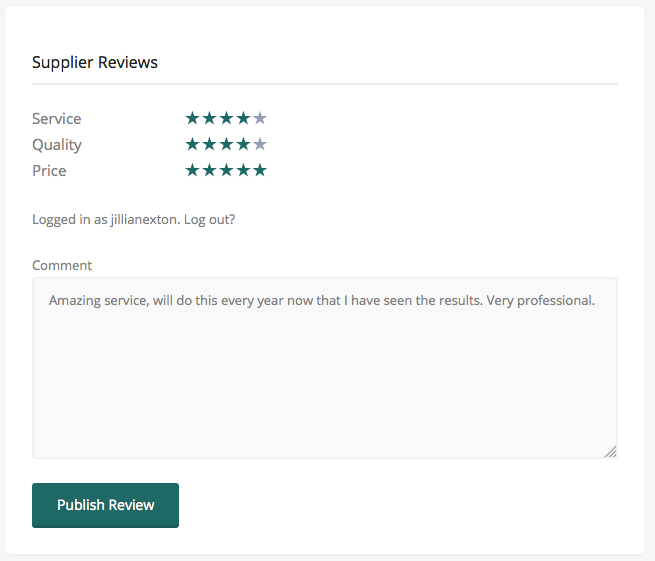 There is the ability to complete a review and leave comment on a supplier’s listing, as well as save them to your favourites list. To review a Supplier select the ‘Submit a Review’ button in the heading of the suppliers listing. Enter your review comments and select the star rating. 5 stars indicated a high rating and 1 star a low rating. Select the ‘Publish Review’ button. 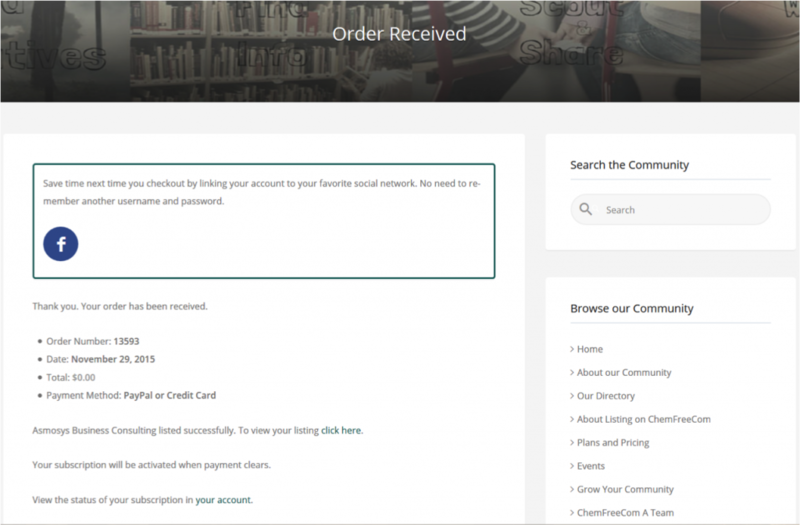 Once the ChemFreeCom admin approves your comment will be listed at the end of a listing. How do I invite a friend or a non-toxic business to the Community? 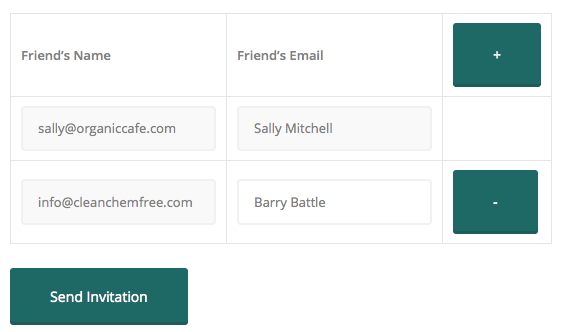 Enter friends email address and their name in the table, click on the ‘+’ to add more lines. An email will be sent to your friend/non-toxic business – refer sample email below. I’m thinking you would really like know about the Chemical Free Community!! So I’m inviting you to www.ChemFeeCom.com because I can! I’m a member of ChemFreeCom and think you could benefit from being a part of the community as well. It is a global online community with a directory and events calendar for non-toxic/less toxic foods, services, product and info. They are new but growing fast. They have some great non-toxic services and products already. I love the idea of a global community that’s drawing together as many non-toxic/less toxic services and products as possible to help reduce families’ toxic exposure. 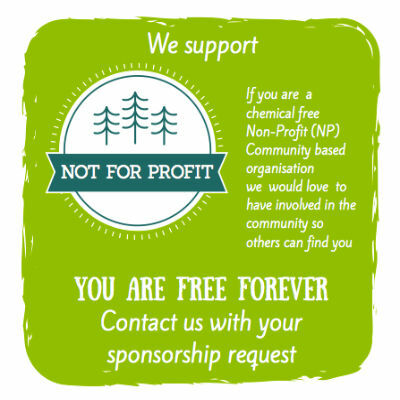 They have some special programs for suppliers at the moment.. so please join the community and share this with your chemical free networks. 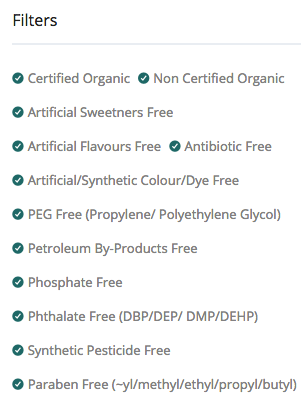 NOTE … if your favourite supplier is not 100% chemical free that is OK.. they allow businesses who are transitioning or have products/service that are LESS TOXIC than their conventional alternative. So head over to http://www.chemfreecom.com/sign-up/ and join the community either as a user or supplier. Let’s build a ‘Chemical Free State of Mind’ community together! How do I access the 9 months free listing offer ? 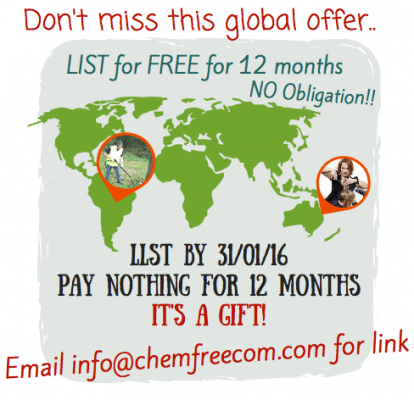 Yes.. you can list your business on ChemFreeCom FREE for 9 months, but wait there is more, there is no obligation to stick with us. No Credit Card or PayPal or contract required. You are able to create your listing on the system with a 9 month trial. You can exit out at any time. Simply work out which subscription level you need – it is based on the number of listings you require. A listing is either a physical location or a website. All memberships have unlimited categories and filters. Our most popular is the BASE membership. If you need Professional, Enterprise or Enterprise Plus please contact us once you have created your first listing and we can organise a bulk load from the back end to save you time and effort! Click on ‘LISTING DETAILS’ and select your 9mth FOC. A new button will appear on your menu which is your DASHBOARD. You will have to reset your password when you next log in. What are the Chemical Free Community subscription levels? There are 4 monthly subscription levels to select from, based on the number of listings required for a business. Each listing is directed at a www and/or geographical location. BASE – allows you up to 3 listings with unlimited categories and filters . If you have up to 3 bricks and mortar shops or different websites this level will suite you. PROFESSIONAL – allows you up to 10 listings with unlimited categories and filters . If you have more than 3 and up to 10 bricks and mortar shops or different websites this level will suite you. ENTERPRISE – allows you up to 20 listings with unlimited categories and filters . If you have more than 10 and up to 20 bricks and mortar shops or different websites this level will suite you. ENTERPRISE PLUS – allows you unlimited listings with unlimited categories and filters . If you have more than 20 bricks and mortar shops or different websites this level will suite you. NOTE: for those selecting any level other than BASE please contact us at info@chemfreecom.com to discuss how we can support you to upload large numbers of listings via the back-end using upload documents. How do I list my non-toxic/ low toxic business on ChemFreeCom? 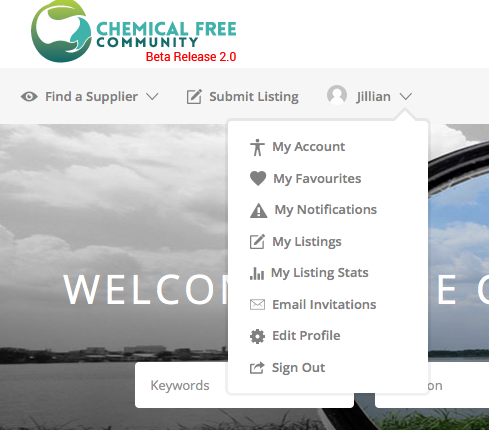 Firstly, sign up and create a user account with ChemFreeCom. Help people find you by using filters or tags. There is no limit to the number of filter you can pick, both groups of filters ‘Chemical Status’ and ‘Free From’ are listed together. Chemical Status has 2 parts. Once you have selected your chemical status tags, which will allow people to search and find you via the tags, you must complete the Chemical Status % for each status you have just selected (Step 10). Unfortunately users are not able to search on these % which is why it is important for you to select both the filter and complete the % for that filter in step 10. Percentages are display for information on the right hand side bar of a suppliers listing. Free From filters enable users to find you for more specific requirements – gluten free, ammonia free etc. Cover image is your header image on the top of your listing. Cover image is optional, should you not load a cover image your first gallery image will be used for the header image. Gallery images is your logo and product/service images. Note: to have your logo display as the first image please upload your logo first. 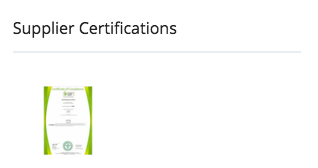 Certification images, if you have tagged ‘certified anything’ in the chemical status we request that you upload your certification certificate including all reference numbers. Enter the description of your service or product. Ensure you include all appropriate keywords for your business in your description so that a users’ ‘keyword’ search will find your business. You should have tagged a ‘chemical status’ in step 6. For every one chosen please identify the % of your entire product line or service offering that is relevant to this chemical status. if a Supplier is listing a restaurant or cafe and they source on average 60% of their total ingredient list from certified organic, they will nominate 60 % certified organic and upload the images of the certification certificates of the suppliers they use. It may be easier just to take an picture on your smart phone of the certification. This validates the certification and differentiates form those who are not certified. Select the ‘Preview’ button to preview your listing. Please note that the Categories and Filter/tags will not be displayed until you save/publish your listing. Review your PayPal/Credit Card subscription details. NOTE: There are no payment details on this page. 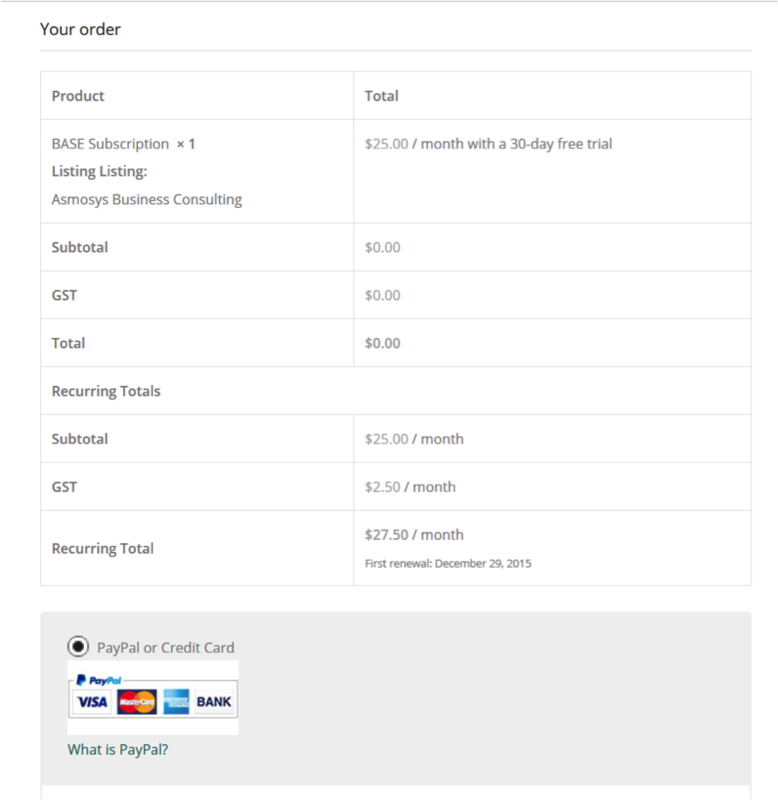 This page sets up a subscription with the appropriate monthly fee as per your selected subscription level. Next screen will provide subscription details. Please select ‘Agree and Continue’. 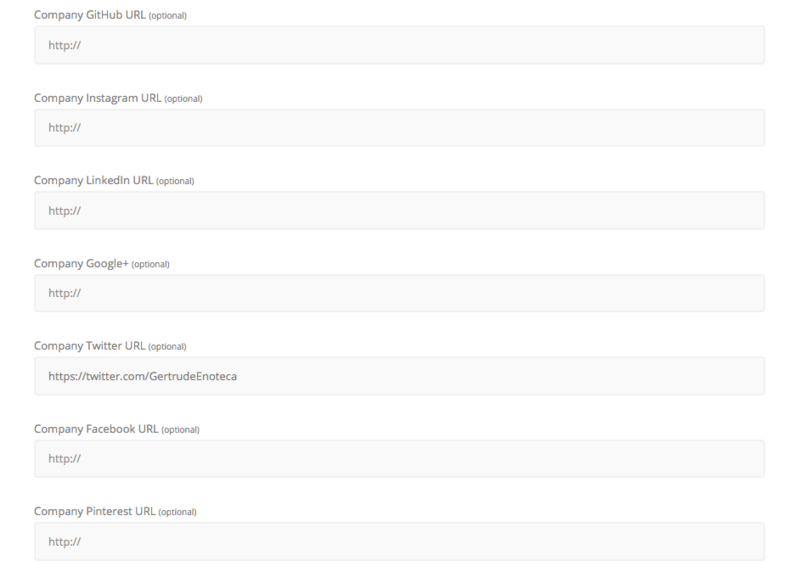 These are PayPal screens and Chemical Free Community has no control of the content displayed on these pages. Where is the tax Invoice? If you have set up an automatic payment with PayPal the statement from Paypal serves as your Tax Invoice. Should you reside in Australia, the total monthly amount is inclusive of GST. To calculate the GST simply divide the total amount by eleven. Should you reside outside of Australia you will not be required to pay GST. Should you require a formal tax invoice from Zoodle Pty Ltd (Chemical Free Community) please contact us on info@chemfreecom.com. What fields does the 'keyword' search from? Ensure all appropriate keywords for your business are covered in your description. Can I upgrade, downgrade or cancel my subscription? 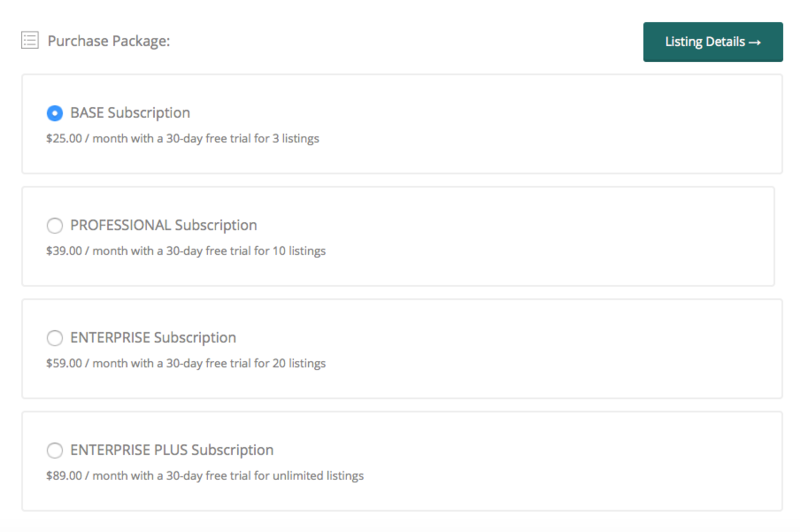 Go to ‘Plan and Pricing’ page and select another subscription. Once you have your new subscription in place you can cancel your old subscription on ‘My Subscription’ section on “my Account’ tab on your Dashboard. Once you have selected the big green ‘Cancel’ button in your ‘My Account’ section both your PayPal & Chemical Free Community subscriptions will be canceled. Your listings will stay ‘live’ during this process. We are waiting on a software upgrade that enables a quicker and smoother transition between subscriptions, we apologies for any inconvenience in the interim. 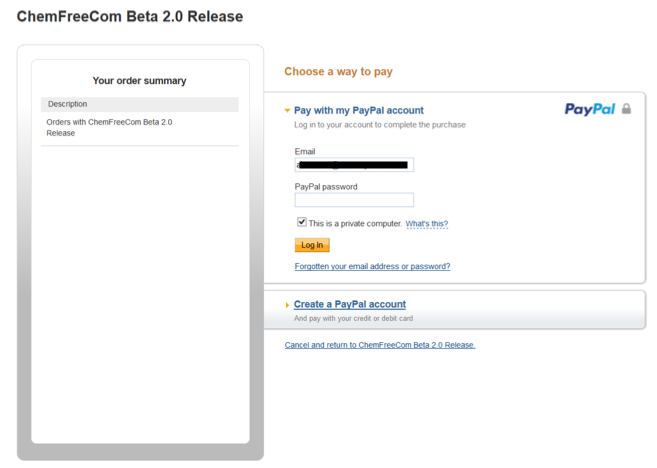 You may cancel a subscription by logging into you paypal account and cancelling your pre-approved subscription. If Users can review and comment on my business can we comment on the User ? Not directly. You will have the option to contact ChemFreeCom Administration regarding any questions or issues. If those issues involve one of our Users, you can let us know. Please use our Contact Page. I already have a video. I don’t have a video but would like one. The ChemFreeCom team can assist you by creating a 30-40 sec sound bite showcasing your business. You would need to send us a 30sec voice recording and 6-12 images that we can use to create a short video. Please contact us via our contacts page to inquire about video production. NOTE: we are not professionals in this domain but love being creative. Can I post to ChemFeeCom's social media pages? 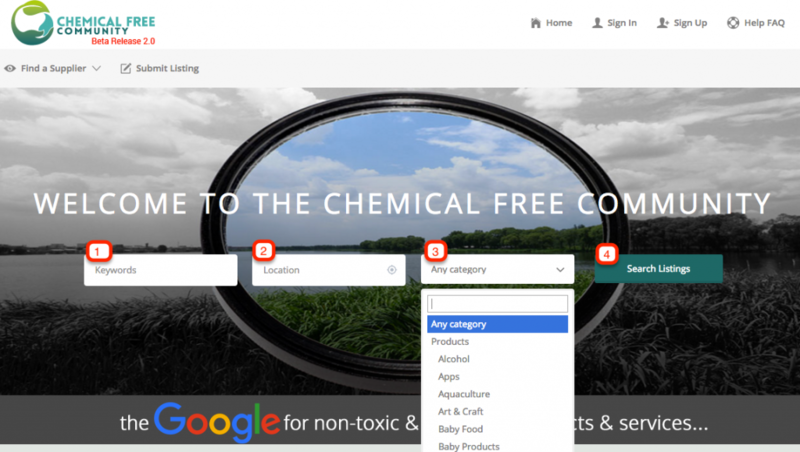 ChemFreeCom will upload an introductory post on our social media: Facebook, Twitter, Instagram , Pinterest and Google Plus for each new Supplier on Chemical Free Community. You are free to comment on your post and contribute to the Facebook , Twitter, Instagram and Pinterest pages. What is the Chemical Free Community Supplier Facebook Group? Conceived after members of our supplier community asked us to connect them with other members so they could work with complementary businesses …we then though we would connect you all! 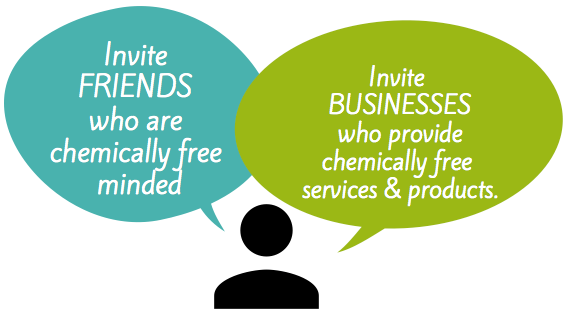 The ChemFreeCom Supplier Community FB group enables our incredible chemical free businesses to connect and collaborate on anything where it makes sense to do so. It may be to join forces on a sales promotion, to share an admin assistance or the bulk order of ‘Who gives a Crap’ toilet paper. For our farmers, it may be to connect and share a pick up of organic produce or feed. What ever it may be, we encourage you to ask for help, information or resources, or even offer help, information or resources. You can also post your activities so that the community can support you. Jump into Facebook and search for ‘ChemFreeCom Supplier Community‘ and ask to join. Keep an eye out for an invite via Facebook. NOTE: this group is specifically for our ChemFreeCom Suppliers. Got events scheduled? Chemical free workshops, e-courses, launches, festivals, film night what ever.. pop them into our Chemical Free Community Events Calendar, just click the ‘LIST AN EVENT ON OUR CALENDAR’ button on the bottom of the events page, fill in the form and submit. We will then publish your event. Can I submit a guest blog on the ChemFreeCom blog page? 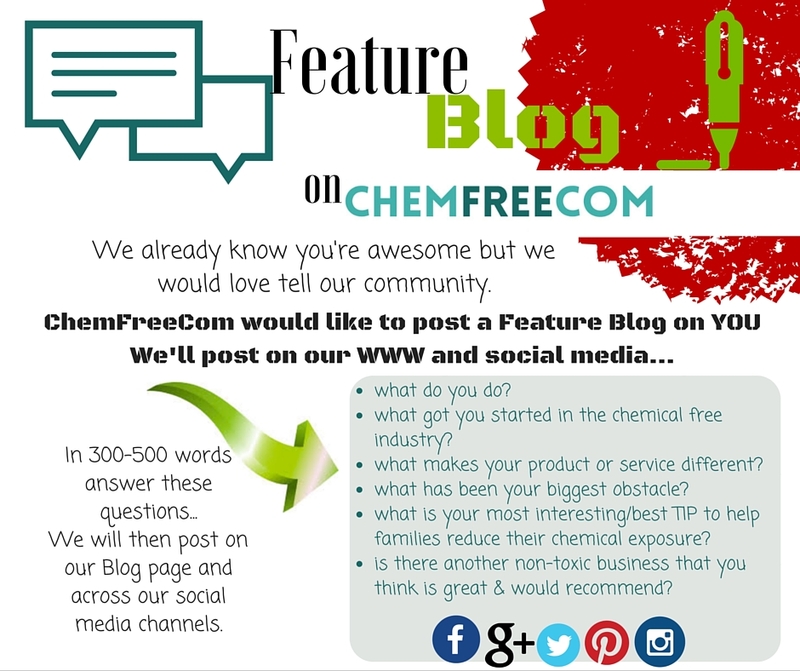 ChemFreeCom welcomes the opportunity for our Suppliers to be guest bloggers. We already know you have a fabulous product/service but we would love to give more details about you to our community. Email to info@chemfreecom.com and we’ll schedule it on our blog and across our social media channels and tag you. How do I prove my certifications? Our ethos is built around integrity and honesty, so you are listing your business under an honour system. When completing your Supplier profile, if you have ticked ‘Certified’ anything, including ‘Certified at point of origin’ then you MUST upload your or you suppliers certification certificates with relevant numbers that can support your Certified status. We will check on a random basis, as our Users will also check as they use your products or services. Do I have to offer discounts to ChemFreeCom members? No you don’t. This is not our expectation and your registration on ChemFreeCom.com is in no way connected to an expectation of discounts. However it looks like we may soon have the functionality to offer this service. Should you be interested please contact us via our contacts page to discuss. Can I get a Category / Free From Filter add to the list? 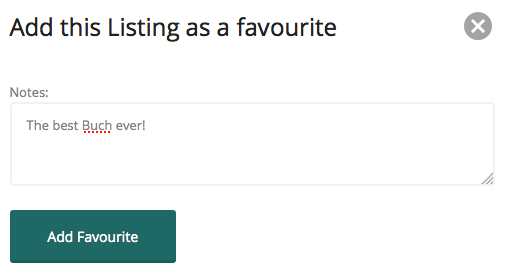 We welcome any suggestions for additions and realise that our search criteria will evolve over time. In an effort to avoid an enormous category list we have provided keyword capability. Before emailing us with a request for an additional category or filter please consider if what you require is best met by adding a keyword in the description of your listing. Please forward requests via the contact page and provide the details of the category/filter and how it can be or should be used. We will happily review and note that the addition came from you. Will there be other businesses listed under my category?? Probably. We do not limit what suppliers may post based on exclusivity or competition. How do I network with other suppliers? ChemFreeCom has a dual focus – B2C and B2B. It has always been important for us to provide opportunities for our wonderful suppliers to connect to grow businesses and the industry. As a Supplier – you are also a User. You can search and contact other Suppliers regarding their products and services. In addition, we have Business Opportunities filters that may also allow you as a Supplier to search and find opportunities for growth and expansion. We invite you to join our ChemFreeCom Supplier Facebook Group that enables you to connect with other members so you can connect and collaborate with complementary businesses on anything. Please see the FAQ above titles ‘What is the Chemical Free Community Supplier Facebook Group?’ for more details. No. We do provide information on the certifications relevant to each country on our Be Informed page and we request that Suppliers verify their ‘certified’ chemical status profile by displaying their certifications, located in the side bar on their listing. Can you help me export my products to other countries? We are a global registry and your Supplier Profile will be available to that global community. We do not provide an exporting service or consultancies in that regard – but if you would like to contact us with these questions, we can use our networks to try and find the right service to assist. Can you help me expand my business? We would like to think that being part of this global community will help. We do have search categories tailored to business growth and opportunities that either you can select as part of your profile or you can search in to find other Suppliers offering such opportunities. You will find the Business Opportunity Categories listed under the Product and Services Categories. Also refer to the FAQ above “How do I network with other Suppliers’. What if I lose or gain certifications - what happens to my listing? ChemFreeCom expects, that as things change, you will come back into your Supplier Profile and update your details.